St. Andrew's is a parish of the Diocese of Kansas, a community of 46 congregations and 10,000 Christians in the eastern third of the state of Kansas. The diocese includes the cities of Wichita, Topeka, Lawrence, Manhattan, and the Kansas side of the KC Metro area, as well as parishes in smaller towns in the region. The central house of worship for the diocese is Grace Cathedral in Topeka. A diocese is a geographic region. It is also spiritually gathered around the bishop. 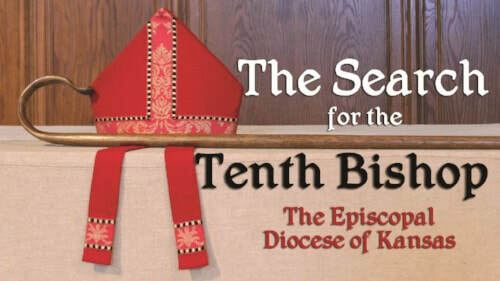 Our Diocese is currently in a new search for the 10th Bishop of the Diocese of Kansas. The word "Episcopal" actually comes from the Greek word for bishops, so it is an important part of our identity that our church life is structured around bishops. The diocese of founded in 1859, a year before Kansas earned its statehood. At first, the diocese encompassed the whole of the state. In 1901, as populations grew, the diocese was split into the Diocese of Western Kansas (running from Salina out to the Colorado border) and the Diocese of Kansas. The mission of the Episcopal Diocese of Kansas is to gather, equip and send disciples of Jesus Christ to witness to God's reconciling love.